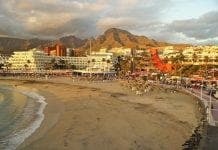 A BRITISH woman was attacked and decapitated in a Chinese supermarket in Los Cristianos on the holiday island of Tenerife yesterday afternoon. Witnesses said the deranged man used a large knife or machete he picked up in the supermarket to stab and decapitate the 60-year-old Jennifer Mills-Westley. He then ran out into the street covered in blood, carrying his victim’s head and telling passers-by, “This is my treasure”. Police arrested the man as he was struggling with a security guard and members of the public and trying to escape. Spanish media reports name the suspect as 28-year-old Deyan Valentinov, who is believed to be a homeless Bulgarian man with a history of mental illness. The British Foreign Office said the British consul has contacted the woman’s family. 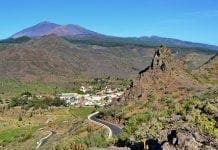 Tenerife is home to about one million residents and one of Spain’s most popular tourist destinations. Take a look at the Telegraph article – it will make you sick. A completely preventable crime – and nothing will happen to the lazy Spanish security guard who could have arrested the pyscho but did nothing until after the crime. I should add that there was a Social Sceurity office further down the avenida where we lived in Guadix – every S/S office in Spain has an armed guard – why did’nt he take control of the siuation when this poor woman went there for refuge from this killer. Of course no blame will attach to him at all, or the fact that he was known to be violent but nothing was done. Some of these news reports are pretty serious while other ones including some comments appear to be made to put Spanish people down and quite sure the same happens with Spanish during vacations in England. I think that since both nations are related and been related for centuries. They should both work out solutions to these problems theu law enforcement, embassies, Crowns which are related and education to both of their citizens. I reside in the USA and as an American see also the same happening thru the states. Some people seem delighted to fleece other groups or cultures and vice versa.